So, I'm going to let you in on a little inside joke that John and I (and pretty much everyone who was at our wedding) tease each other with. I have the propensity to go veeeeeeery long without having so much as a sip of water. It's weird and not that good for me, but I just don't get thirsty. Ever. 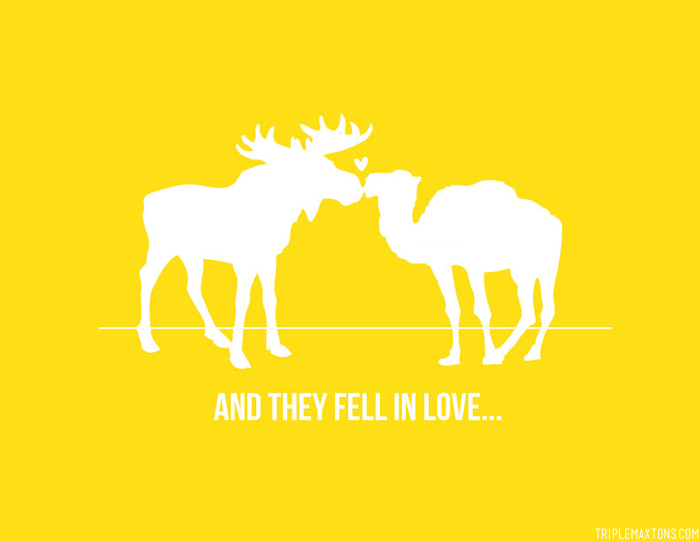 Within the first month of dating, John started noticing this and began calling me "dromedary" or "camel woman." Andrew, John's big bro and best man at our wedding, really got us laughing during his speech when he brought up that John had been telling his fam I was a total camel when they asked about this mysterious new girlfriend he had met in Florence, Italy. It's an odd term of endearment, but a term of endearment nonetheless from a guy that I was totally gaga for. I had a couple nicknames for him, but it wasn't until I watched a show about wild moose that were ravaging Alaskan towns that it dawned on me - John was TOTALLY a moose. How could I not have seen it before?? The ultra long skinny legs, the giant stature, the enormous melon-sized head (the better to hold all those genius ideas). Yep. I don't know what sparked it, but last night I started thinking about our nicknames, got a visual in my head, and could not stop giggling. It became all too apparent....we were one goofy match made in heaven, and I had to put it on paper that instant. I started fiddling around in Photoshop and voila- easy peasy custom art that perfectly captures John and I in a whole new light. That print is so cute. I would buy that! That is just completely and utterly charming. Love it! Ha! My G reminds me of a giraffe... the shared first letter, his curly hair sometimes sticks out like those little fuzzy pegs on a giraffes head, and he's really tall/skinny! :) PLUS, they're my favorite animal and he's my favorite dude.